It took decades of research to accumulate the observations that led to the emergence of the theory of plate tectonics in the late 1960’s. Many contributions participated in its final acceptance — or “birth” — with seminal publications in (1) 1966 on the perfectly symmetrical distributions of magnetic anomalies on either side of the East-Pacific rise by Walter Pitman and James Heirtzler, (2) 1967 on the first test of rigid plate rotation in the Pacific by Dan McKenzie and Robert Parker, and (3) 1968 on the first global plate kinematic model by Xavier Le Pichon. International symposia stimulated by these publications were organized to celebrate the 50th anniversary of plate tectonics, in 2016 at the Lamont-Doherty Observatory (USA), and in 2017 at the Geological Society of London. 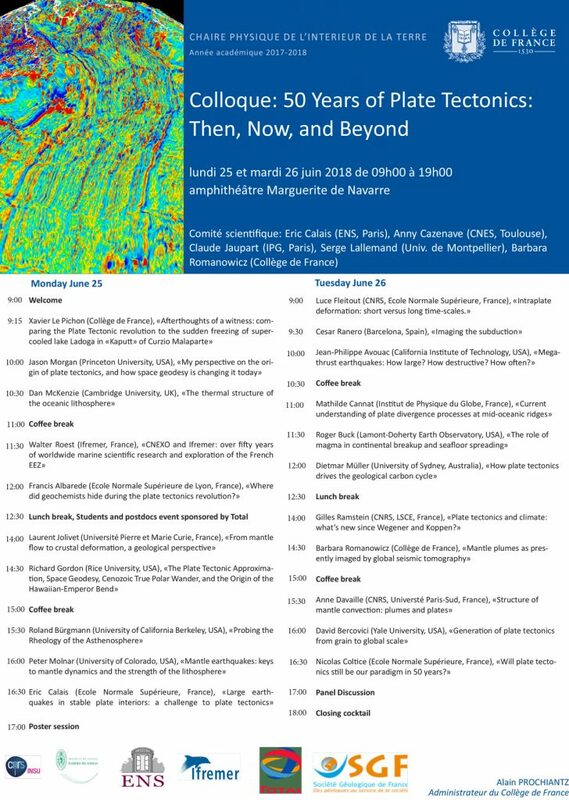 We contribute to this series with a third symposium in France in June 2018 that coincides with the 50th anniversary of Xavier Le Pichon’s 1968 landmark paper. This symposium will include historical elements but focus mostly on the current status and challenges in plate tectonics and large-scale geodynamics, with contributions from an outstanding international group of speakers. Registration is free. Students and postdocs are particularly encouraged to present a poster and to attend the Total luncheon on the 25th. We hope that you will join us for this exciting scientific symposium, hosted by the Collège de France in the heart of Paris! The organizing committee: Eric Calais, Edouard Bard, Anny Cazenave, Claude Jaupart, Serge Lallemand, Barbara Romanowicz.